Greetings from your WoodWeek news team. Logs, logs and more logs. 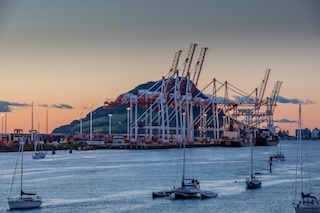 Late last week, Port of Tauranga reported that first quarter trade volumes grew 8.3% on the same period last year. From 1 July 2018 to 30 September 2018, the Port handled more than 6.6 million tonnes of cargo. The increase was driven by log exports, which was up 14.7% on the same period last year. Increased exports of softwood lumber from Russia to China the past decade have resulted in higher timber harvests in Eastern Russia, reports the Wood Resource Quarterly. In 2017, Russia’s total harvest reached an estimated 190 million m3, six percent higher than the previous year. Practically all of the increase was in Russia’s eastern provinces. Over time, Chinese importers have gradually shifted their historical preference for logs from Russia to New Zealand. 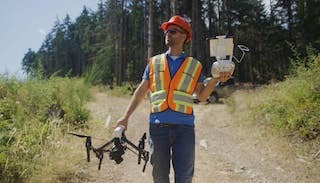 In a just-released video entitled “Forest for the Trees: How technology is transforming BC’s forest industry”, University of British Columbia forestry professor Dr Nicholas Coops emphasises LiDAR and drone use are just two more recent examples of the forest sectors technological revolution, and the types of technology incorporated into every-day forest management. Dr Coops was a speaker in the recent ForestTECHX Vancouver international conference organised and run by Innovatek in conjunction with Logging & Sawmilling Journal in March. 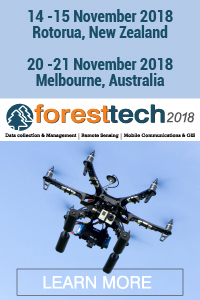 This world-leading forest technology and management conference drew a wide international audience of technical foresters from as far away as the New Zealand, Australia, Estonia, Chile and the UK. 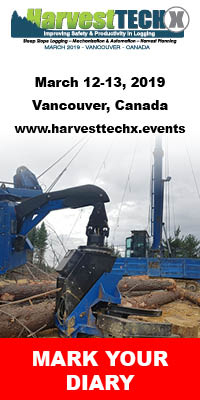 Innovatek’s next forest technology conference in Vancouver is HarvestTECHX, running on 12-13 March 2019. This event sold out when it was last run in BC in 2016. For details see https://harvesttechx.events/. Top primary sector employers shortlisted - Attracting and keeping the best people working in our primary industries is one of the most significant challenges for the sector, Minister of Agriculture Damien O’Connor said as he announced the finalists in the first Primary Industries Good Employer Awards. Two forest industry companies have made the shortlist. Best crop choice: Trees or bees? 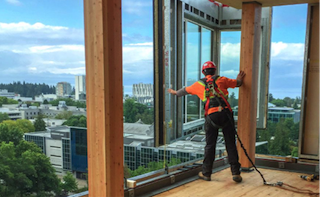 Michael Green: Can Future Cities be Timber Cities? Chinese importers have gradually shifted their historical preference for logs away from the Russian Federation towards New Zealand and instead are importing softwood lumber from their forest-rich neighbour in the north, according to the Wood Resource Quarterly. The percentage of lumber as a share of total log and lumber volume (in roundwood equivalents) has gone up from 58% in 2014 to almost 80 % in 2018. Trees or bees? That was one of the questions hashed out a recent Bay of Plenty Farm Forestry field day. 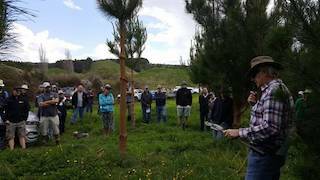 The event, held at Neil Mossop's coastal hill country property at Pikowai, drew more than 40 participants keen to hear why commercial forestry had been chosen in preference to manuka honey or livestock grazing. Mossop had recently harvested his first crop of radiata pine and although a significant manuka honey producer, he chose to replant his site in genetically improved radiata which were now just over three years old and growing like rockets. The previous crop had netted an average of around $50k/ha for him after only 22 years, with one block exceeding $60k/ha. • To prune or not to prune? • What is the future for Carbon Forestry? • What alternative investment structures are there? • Why should I attend FFA's 2019 conference at Rotorua? An experienced and diverse lineup of speakers addressed these topics. Consultant Jeff Tombleson and Graeme Young from Tenon addressed the vexed question of whether Mossup should prune his second crop of trees. While costs have gone up and many corporate forest owners do not now prune, many felt it was still a good strategic investment for smaller forests. A demonstration of pruning tools and techniques followed with some first time foresters trying their had at pruning. Wood product output from plants in Guangdong Province has been steadily increasing in tandem with increased of domestic and international demand. In 2017 total output from mills in Guangdong Province exceeded 10 million cubic metres. Much of the raw material is available locally and the standing forest stock in Guangdong Province is over 600 million cubic metres say analysts. The expansion of wood processing industries in Guangdong Province has driven investment in forestry and an increase in timber imports and advances in recycling and residue utilisation. The total value of wood product output in Guangdong province in 2017 was RMB802.3 billion, a year on year increase of 4% and accounting for 12% of the national total. It is estimated that there are more than 20,000 wood processing plants in Guangdong employing some 3 million people and this sector has contributed to economic development and social stability in Guangdong Province. Log imports are an important source of raw materials for wood processing plants in Guangdong Province accounting for over 50% of raw material requirements. In 2017 about 63 million cubic metres (log equivalent) were imported with about a quarter of this transported from Heilongjiang, the Inner Mongolia Autonomous Region and Jiangsu Provinces. Turnaround for Tasmania’s forest industry - The Annual Reports of both Sustainable Timber Tasmania and Private Forests Tasmania paint a picture of a growing, sustainable industry. It is pleasing that Sustainable Timber Tasmania today has announced a healthy statutory profit including an underlying profit of $6 million - a $20 million turnaround from last year’s underlying result. This is the first operating profit reported by the public forest manager since 2008-09. STT has now retired all debt, as well as delivering a $15 million special dividend to the Government. This is the first time in a decade that the public forest manager has been debt free. This result reflects a more efficient operating model following the restructure, improved prices for products, and increased sales volumes. In accordance with standard accounting practices, the profit result was not directly impacted by the $60 million sale of forestry rights to 29,000 hectares of hardwood plantations, which was treated as a non-operating asset sale. The Government thanks the Board and staff of Sustainable Timber Tasmania for their hard work in achieving this result. In further good news, the Private Forests Tasmania annual report shows the total private forest harvest rose for the sixth consecutive year, with a 9 per cent increase to 4.25 million tonnes. While these are positive results, the Government is aware that challenges remain in rebuilding the forestry industry. The Hodgman Liberal Government has been working hard to turn things around since the Labor-Green disaster, and we are committed to ensuring the industry continues to grow. Top primary sector employers shortlisted - Attracting and keeping the best people working in our primary industries is one of the most significant challenges for the sector, Minister of Agriculture Damien O’Connor said as he announced the finalists in the first Primary Industries Good Employer Awards. How technology is transforming forest industry in western Canada: Video just released - For forest companies, like TimberWest in British Columbia, the health of the trees and associated ecosystems are paramount. From seedling to maturity, the trees must be monitored and any problems addressed. The way in which this monitoring happens is changing dramatically through the convergence of new sensing technologies such as LiDAR, and the ability to deploy sensing technology using drones. Once used only for air space and meteorological research, LiDAR (commonly referred to as airborne laser scanning) is now being used for forest research to more accurately examine everything from the height and diameter of trees to ground terrain evaluation and plot-level wood volume estimates. In the just-released video Forest for the Trees: How technology is transforming BC’s forest industry, University of British Columbia (UBC) forestry professor Dr. Nicholas Coops emphasises LiDAR and drone use are just two more recent examples of the forest sectors technological revolution, and the types of technology incorporated into every-day forest management. Dr Coops was a speaker in the recent ForestTECHX Vancouver conference organised and run by Innovatek in conjunction with Logging & Sawmilling Journal in March this year. This world-leading forest technology and management conference drew a wide international audience of technical foresters from as far away as the New Zealand, Australia, Chile and the UK. At the turn of the century in the United States, when cities were booming and new construction changed city skylines daily, wood was a common building material. As fires plagued early cities, however, a shift towards steel and concrete as more trusted construction materials—both mass energy consumers and non-renewable resources— became commonplace. Michael Green, one of the world’s leading experts in building skyscrapers out of wood and principal architect at Michael Green Architecture (MGA), hopes to change that. Cross laminated timber, a common building material for MGA, is as strong as steel and fire resistant. The panels are engineered and designed with cross directional grains that increase the weight bearing potential of the beam and allow single columns to run through multiple floors. Once these prefabricated materials are shipped to a construction site, they don’t require any cutting or machinery to assemble and can be quickly fastened with hand tools, drastically decreasing the noise and air pollution generated by the construction. A wool surfboard – who would have thought? - New Zealand surfer Paul Barron was laminating a board a decade ago when he accidentally spilled resin on his sweater. It gave him an idea: What if he built a surfboard shell out of wool? Traditional foam boards are typically housed in resin and fiberglass for structural integrity. But fiberglass can be harmful to workers and isn’t easily recyclable; board makers have long sought a greener alternative. This month, the Carlsbad, California, company Firewire Surfboards is releasing Barron’s WoolLight board–showcasing a technological advance that could change how other products are designed, from yachts to cars. WHY WOOL - Living in a country with six times as many sheep as people, Barron was familiar with the benefits of wool: It’s recyclable and biodegradable, and it doesn’t require much energy to manufacture. But wool also absorbs water and is porous and flimsy when woven. To refine his idea, Barron partnered with the New Zealand Merino Company, an organisation that incubates new uses for wool and connects local producers to retailers, such as the cult shoe brand Allbirds. HOW IT WORKS - The wool sheared off a sheep is up to 3 inches thick, with fibers flaring out in all directions. Barron developed a vacuum-pressure technique that converts this bulky material into a thin wool-and-bioresin composite, with a compression strength that rivals that of fiberglass and polyurethane. According to Firewire CEO Mark Price, the process reduces CO2 emissions by 40% and VOC emissions by half, compared with traditional construction. And because wool bends easily, the WoolLight is more flexible, which reduces vibrations when catching waves, Barron says. When Barry came home, his wife Mary was crying. “Your mother insulted me,” she sobbed. A big-game hunter went on safari with his wife and mother-in-law. One evening, deep in the jungle, the they awoke to find her mother gone. Rushing to her husband, she insisted on them both trying to find her mother.